Translating websites and e-commerce stores has never been easier. While in the past it would involve a lot of manual work and getting the developers and designers involved, all of these steps can be skipped now. But apart from the language you choose to speak to your customers with, you need proper scaling, cost-estimation and preparation for going global. There are millions of online guides about website and e-commerce translation, but they keep on suggesting the same approach, just like ‘website’ was a synonym of ‘e-commerce’. Of course, an e-commerce website is still this: a website (Captain Obvious strikes again). However, we want to reveal a little secret: translating website effectively is a bit different from translating e-commerce effectively and you should probably take a different approach depending on which one you want to translate. Or at least you should know the differences between these two types of projects. And so should your Language Service Provider. It is enough complicated to translate small websites under 500 subpages and it can cause a lot of headaches when you have to figure out how to make it on your own. Let me give you a hand – are you ready for a short analysis? This option requires manual transfer of XML, HTML or CSV files from your CMS database to a translation service provider —most likely with some help from your IT staff. There is no automation involved with this decidedly low-tech method of working. Depending on your CMS, the approach can lead ultimately to copying & pasting translated content due to text length issues or a plethora of other code-related reasons. It might be employed if your site is small with relatively static content. If you use one of the most popular CMS, this method enables you to select and export content for translation and import translated one back from within the CMS. Some of the most robust CMS enables users to automate the retrieval and monitoring of content changes from within CMS and serve dedicated user interfaces for translation management in the same CMS environment you use to write content. The usual setup for a multilingual CMS requires an installation of a dedicated plug-in in your CMS. The choice is broad – from free to paid ones and the installation process is usually quite simple. The approach often enables your translated pages to be indexed by search engines (so they are SEO friendly). If you choose this approach, you will love it not only because of its automation but also because of the Website Translation Live Editor, thanks to which you can see exactly what do you translate and do it always in context. This approach of translating websites directly on a page, while a translator is looking at it, is producing great results. So, no need for sending excel files to ‘somebody’ – just connect your website to the translation platform, go to your website, click on a sentence you want to translate, translate it, and click “save”. And it’s done. Sounds perfect, right? #1. 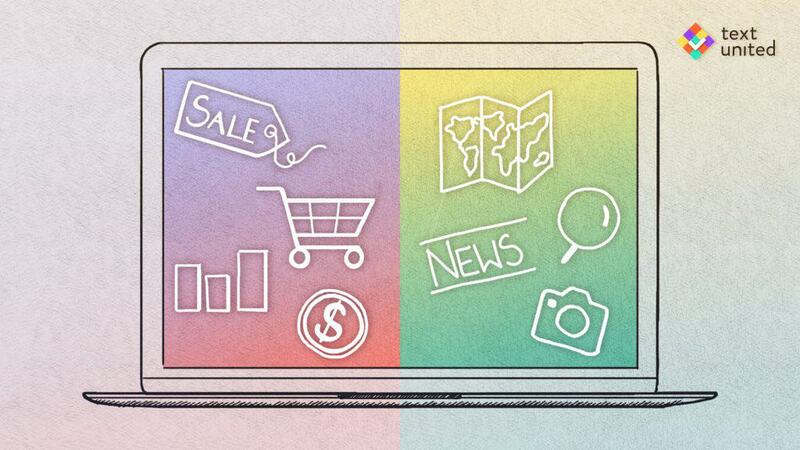 E-commerce stores can be significantly larger and have more content than company websites. A small website has around 500 subpages, a medium e-commerce store can have a few thousands of subpages. #2. E-commerce stores usually have a lot of repetitive content like product descriptions. Another question is: how should you handle these? 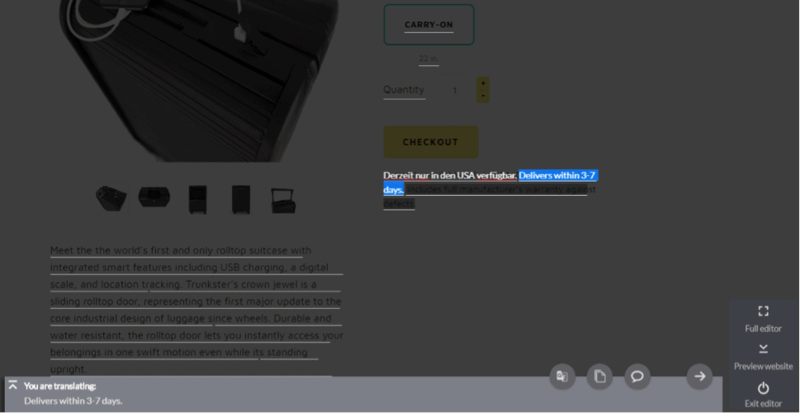 Solution: With an easy use of project setup wizard, a system like Text United scans the whole online store and the user can manually select which pages will be included in the translation project. New content can be added at any time. Large projects with thousands of pages and products can be translated in batches by multiple translators. Thanks to that solution, you can choose the categories or subproducts in certain markets and publish ‘less popular’ categories later on. That means you don’t have to wait to publish the whole version of your translated e-commerce, but you can just consequently go with the flow. Solution: One of the many perks when using an advanced translation platform is Translation Memory and Terminology Management. With e-commerce pages that have hundreds or thousands of products, they generally have a lot of repetitive content. A proper translation platform analyses your online shop and breaks it down into segments. These segments are usually sentences and sentence-like units and it is easier to read, translate and edit them instead of translating huge chunks of text. When a sentence is translated that appears throughout your website 100 times, the system will automatically place the translation in these 100 segments. For sentences that are not 100% identical, but share a high level of similarity, they will have translation memory proposals available and with one click – you can insert the proposal and edit the translation. Solution: Pictures with embedded text need to be handled manually. If your e-commerce contains a lot of banners and graphics, it’s best to extract the text and create a separate translation project. After the content is translated, your graphic designer has to re-create the images with the translated text. That’s a fact: Translated text can easily get up to 30-40% longer than the original text. This can cause issues with the whole UI of your website. It can be prevented as the overlay editor for website translations allows customization of text size, font and frames. Even if you translate your huge e-commerce online shop with the resource-files approach, you can still upload your files to translation memory and reuse the content for the translation in the live editor. Remember: when you have proper formatting tools built in, there will be no issues with overflowing text. There’s not an existing peculiarity that you couldn’t turn to your favour!